We'll be the first to admit that making fun of Guy Fieri is a great way to pass the time. But for all the easy jibes one can make about his hair, restaurants and personality, you've got to give the guy credit for his philanthropy. Fieri, along with José Andrés, has been working with relief organizations in Northern California to help feed victims of and workers fighting the wildfires that are ravaging communities there. Operation BBQ Relief is where Fieri is focusing his energy — in the city of Redding, which is right next to the blazing Carr Fire. So far, six people have been killed in the fires and more than 800 structures have been damaged. Operation BBQ Relief is the same organization he worked with to help those affected by wildfires last year in Sonoma County. 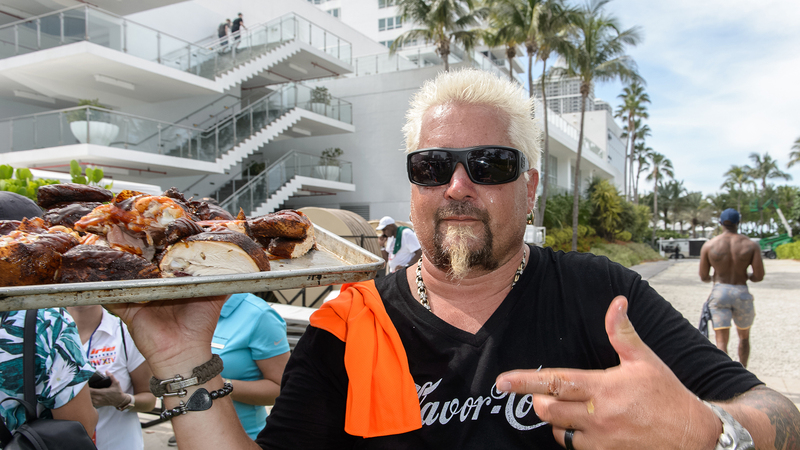 Fieri has partnered with José Andrés, who is well known for his activism. Andrés spent more than a month in Puerto Rico after Hurricane Maria in 2017, serving more than 2 million meals to those affected by the storm. Now, Andrés and his organization, World Central Kitchen, are working with the Red Cross, Salvation Army, the California Office of Emergency Services and Operation BBQ Relief to help distribute meal to the tens of thousands of people who've been displaced by the fires. It's an admirable pursuit, and one that makes us feel a little more amiable toward the donkey sauce-slinging Fieri. So many celebs would just donate money, but seeing him actually go to the place where people are hurting to put a smile on their faces and do the actual hard work of getting them fed definitely tugs the heartstrings.